It took me 26 years to earn my first press credential. It took my son less than five. Charlie – a laminated media pass dangling from a lanyard around his neck down to his knees – joined a group of Dolphins fan website moderators for a team-organized Web Weekend Training Camp event last Sunday. At the conclusion of a closed practice, each attendee was granted field access to interview a select group of players, wandering down a short flight of stairs from our covered riser to a walkway through the bleachers seats to a designated area behind the left goal post. While I’d normally join the scrum during media availability sessions to ask right tackle Ja’Wuan James and center Daniel Kilgore about preseason takeaways and the offense’s progression, I took in the moment from the back of the assembled group. Standing under the Florida summer sun and scant, grey-white cloud bubbles hovering above Nova Southeastern University, I soaked in a rare opportunity to cover a sporting event with my son. But what he lacked in football experience and knowhow, he made up for in enthusiasm and encouragement. He giddily high-fived James and Kilgore, who bent down to their knees to greet the youngest media member in attendance. As the players walked off the field, he raised his arms in the air and chanted, “Go, Dolphins!” and innocently broke a media rule by snagging autographs for his personal collection. 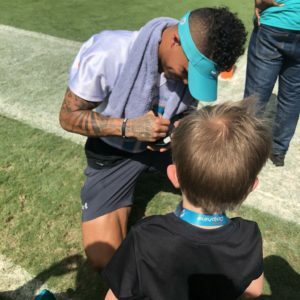 Before departing, we stopped to greet Kenny Stills, who’s renowned for staying long after every practice to sign and take pictures with fans, just as he did for us last season. True to form, the Dolphins wide receiver smiled and chatted with an animated Charlie, who collected his second lifetime autograph from No. 10 – except this time, on a miniature toy ukulele that rarely leaves his side. 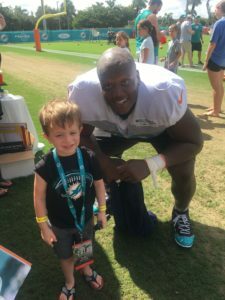 Just then, we recognized another Dolphins player who exited the locker room – the star quarterback whose left knee brace fascinated Charlie throughout practice (“How did he get that boo-boo?” he’d asked me repeatedly). 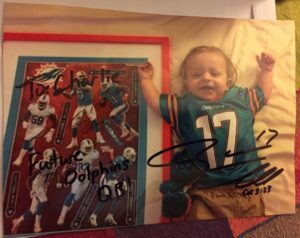 Although Charlie doesn’t know it, he’d stockpiled his first Ryan Tannehill autograph before he was even born. Back in October 2013, during Web Weekend X, each invitee was handed a single raffle ticket, and Michelle – then five months pregnant – received a second one for the baby. The last drawing of the evening was for a mini-Fathead set signed by the Dolphins quarterback, and of course, Charlie’s number proved to be the winner. Fast forward to Sunday – nearly four years later – and Charlie finally had a chance to meet his favorite player in person. While he was too shy to ask the quarterback about his “boo-boo” – he’ll get his media chops soon enough – he did hand him that trusted ukulele. 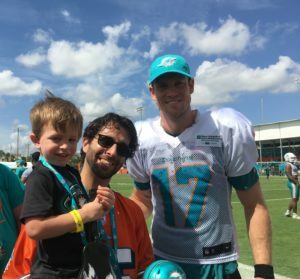 A surprised Tannehill laughed before graciously signing the slightly-peeling body of the musical instrument, and gave Charlie a resounding high five after learning the full backstory of his connection to the young fan. Although Charlie may not have jotted down notes or gathered enough quotes to submit a full practice report, he interacted with four key offensive starters, and even walked away with a bagful of keepsakes. Not bad for a rookie journalist covering his first of what will surely be many Dolphins events.